An odd-ball is always trying to be as cool as his cousin Spike. Failing attempt after attempt, he calls a hotline called Horrorscope, which grants him his wishes with devilish side effects. 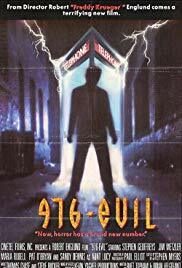 The fact that 976-Evil was directed by Robert Englund in the late 1980’s makes well worth the watch by itself. Englund brought the Nightmare on Elm Street’s cheese into his first film. 976-Evil is a decent comedy horror with a humorous tone, funny character perceptions and weird plot twists. All this stems from the main character Hoax, played by Stephen Geoffreys, who is best known for his role in Fright Night. Aside from the originality of 976-Evil’s horror/comedy complexion, there isn’t really a whole lot else offered. 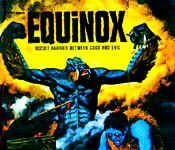 Special effects near the end were awfully bad and a lot of uninteresting scenes were persistent throughout. Also, two lead characters were introduced in a really weak way, no character development, just thrust quickly towards the end. So is 976-Evil worthy of a watch? … perhaps. It fails at getting more pros than cons for sure, but depending on your taste of horror you might like it (i.e. if you like cheesy horror).